Phil Heywood plays fingerstyle guitar with a bluesy swing and a bucketful of whatever it takes to turn an instrumental piece into an arresting lyrical narrative. His lucid playing encompasses the down-home rhythmic groove of a Mississippi John Hurt or Leadbelly, and the sheer fluidity and melodic flair of such contemporaries as Leo Kottke. A soul-satisfying instrumentalist, Phil draws listeners in with his voice as well, singing in a warm, plainspoken baritone that blends smoothly with his rock-solid guitar work. Heywood has been based in Minneapolis-St. Paul since the mid-eighties, performing locally and regionally while also establishing himself in the greater guitar and acoustic music world. 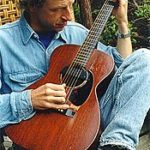 In 1986 he won the National Fingerpicking Championship, and followed up a year later by winning the American Fingerstyle Guitar Festival Competition. Phil has played on NPR’s A Prairie Home Companion with guitar legend Chet Atkins, performed with fellow acoustic guitar luminaries Peter Lang, Pat Donohue, Tim Sparks, and Dakota Dave Hull, and opened shows for such artists as Norman Blake, Greg Brown, John Renbourn, Chris Smither, and John Hammond.